We like to talk with our artists to get a sense of their beginnings and inspiration, as well as their current work and where they see their work evolving in the future. 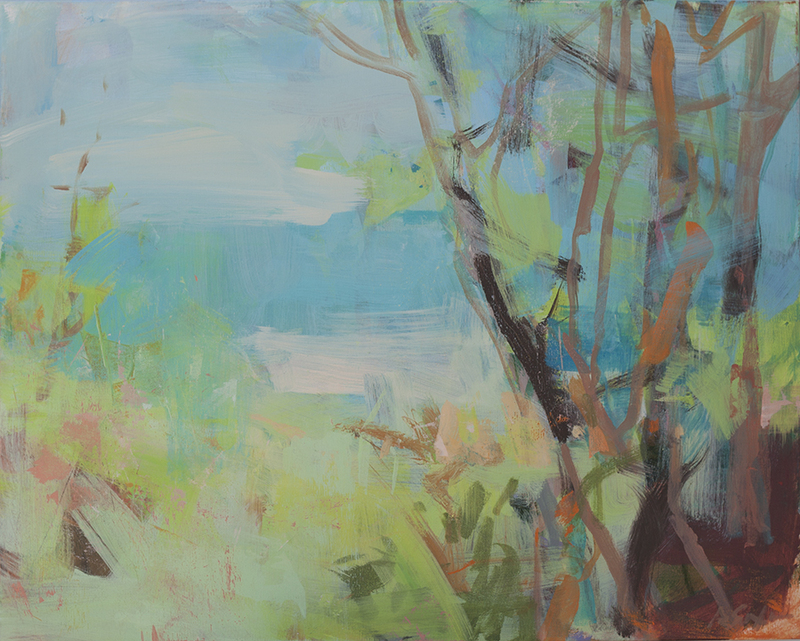 Today, we’re speaking with painter Angela Saxon, who is the Featured Artist of June. I was one of those kids that when asked, ‘what do you want to be when you grow up?’ I always said ‘an artist.’ There were sketchpads and pencils along on most family camping vacations. And I can’t remember a time when I didn’t have memories of the Art Institute of Chicago. I didn’t necessarily have a wealth of art supplies growing up or a fabulous art program in my early schooling. But I have always been an observer of the world around me and felt a need to record it. After college (BFA in Painting, Indiana University), I moved to Chicago and primarily painted large, expressive interiors. A few years later we moved to northern Michigan and there was the landscape. Couldn’t be denied. The Leelanau Peninsula is a spectacularly beautiful place and I was absolutely compelled to both be outside in it and paint it. All of my work was done out in the landscape en plein air until 2015. It’s rather a muscular endeavor to manage 3’ x 4’ canvases outdoors, and it was always a challenge to get what I wanted. I went to Italy in the fall of 2015 and made small gouache paintings while there. During the following winter I realized how engaged I could be working on large canvases with the small gouaches as reference. I continue to work that way now. By working small and very portable when outdoors I gather many more details of the landscape and then when I’m in my studio, I can work in a meditative, constructive way on large canvases. Richard Diebenkorn, Willem de Kooning and Henri Matisse have been visual mentors for me for a long time. I study the structure and color and beauty in their work. I love the world that is created within Cecily Brown’s landscapes, I want that kind of getting lost in a painting in my own work. I relate to the expressive mark making of Joan Mitchell and Eric Aho. The underlying structure of the quiet Italian landscape drawings and paintings of Giorgio Morandi remind me to stay focused. Can you describe your process for creating a work of art? Are there any colors that you particularly like using? I am a perceptual painter. I scout a location and typically return to that same area dozens of times or even for years. When outside, I work in gouache and watercolor crayon. The collection of paintings from each location is the source material for larger studio work. I don’t think I have any particular colors that I gravitate towards though my overall palette has been bright for a few years; I think a lot about bright light vs shadow. I also like to find different ways to help me see my paintings as they are progressing. Often I make very simple small pencil studies of them to sort out the composition or other details. This past year I started making paper collages of the paintings. The simple shapes of cut paper helped me to make decisions about color and value as well as composition on the canvases. I don't always glue the cut paper into a finished collage; sometimes I just want to play around with the shapes without any concern for something finished. The collages have worked really well to help me to get a fresh perspective on work in progress. Most of the work in your exhibit at Vivid seems to be inspired by nature in the Traverse City and Leelanau Peninsula area. Can you tell us a little bit more about the work in your exhibit? I am my truest self when I’m outdoors. Nature has been my inspiration for over 30 years. The specific evolution of my current work came about as a result of lifestyle changes due to health issues a few years ago. I was forced to slow down a bit. While out painting I didn’t have quite as much energy so I spent a more time looking. Sometimes I didn’t paint at all, but sat and looked for a few hours at a time. Observing what was up close to me, beside me, all around me, absorbing the colors and the light. This careful focused looking became exhilarating and informative. I saw SO much more than I ever had before. Now that my energy and health are back to full strength, I strive to maintain this new skill of deliberate focus in looking at my subject and in painting. 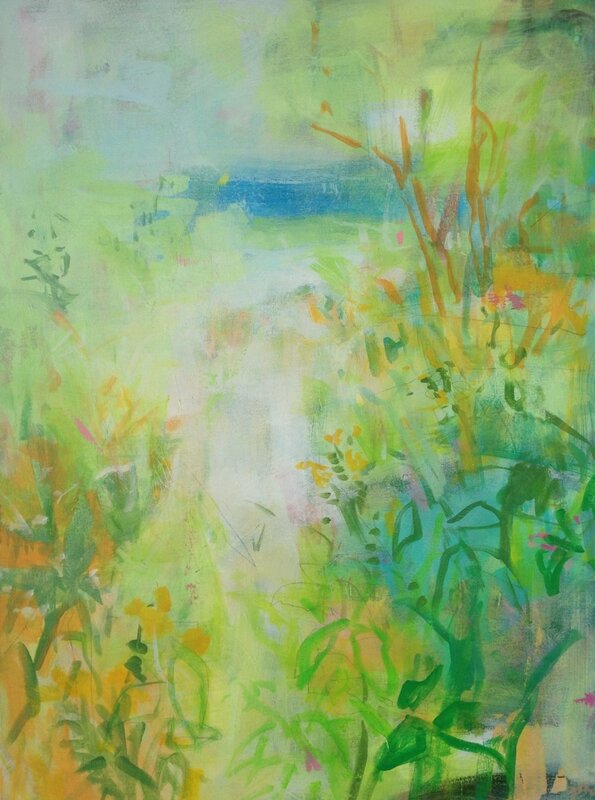 Foreground elements have become a predominant in the work; I’m engaged with ferns and wildflowers and beach grasses and the like. These paintings are more detailed but also more atmospheric and the landscape is more abstracted. I love working large, so maybe even bigger paintings are in my future. I’m also thinking about round canvases.